It will be a proud moment for Keiren Westwood when he walks out on to the hallowed Hillsborough pitch tomorrow. Westwood, who has helped turn Wednesday into a genuine Championship force, is set to make his 100th appearance at home to Rotherham United. His contribution to the cause should not be under-estimated. Since arriving on a free transfer in July 2014, Westwood has racked up an impressive 37 clean sheets. His handling, shot-stopping and decision-making has consistently been of the highest order. The centre-back pairing of Tom Lees and Glenn Loovens have provided a solid platform for the Owls but Westwood has stepped up to the plate time after time. He repeatedly saved them, for example, in the midweek win over Barnsley, producing a series of excellent saves. It has not been all plain-sailing for Westwood. There has been the odd blip here and there. He will be the first to admit he should have done better for the goals conceded at Brentford and Birmingham City earlier this season. But the highs have far outweighed the lows for the Republic of Ireland international and he has shown exactly why he is regarded as one of the best shot-stoppers outside the Premier League. You could argue Westwood’s finest performance in Wednesday colours came in the Championship Play-Off Final. Had it not been for his heroics, the Owls would have lost by a far greater margin to Hull City. And Westwood is satisfied with the part he has played this term as the Owls look to go one better. “I’ve done okay and I think the consistency has been there so I’m happy enough,” he told The Star. “I’ve played a lot of games in two and a half years so to be coming up to 100 games is great. Wednesday will be targeting a third consecutive home win when they face a Rotherham side who have yet to win on the road. Another big crowd is expected at S6 this weekend and Westwood believes the fans can roar the team on to three more points. 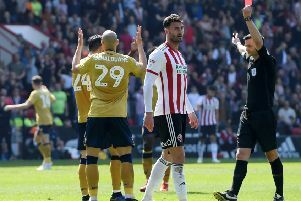 The 32-year-old, who is confident the Owls will be involved in the promotion shake-up come next May, said: “Derby games are always massive. The fans will have a big part to play. We need them again to help create a special atmosphere at Hillsborough.